In February I came across several articles citing recent research relating political orientation and IQ levels. They all had similar findings. It turns out that a lower IQ is correlated with conservative political beliefs. A study by Brock University in Ontario and published in the journal "Psychological Science" and another by Brian Nosek, psychologist at the University of Virginia, both show that the less intelligent a person is the more likely they are to embrace conservative policies. Explaining this may be a complicated matter, but Nosek has put forth a pretty decent theory. He believes that a lower cognitive capacity makes people more attracted to simplifying ideologies. On the surface it certainly seems to make sense. 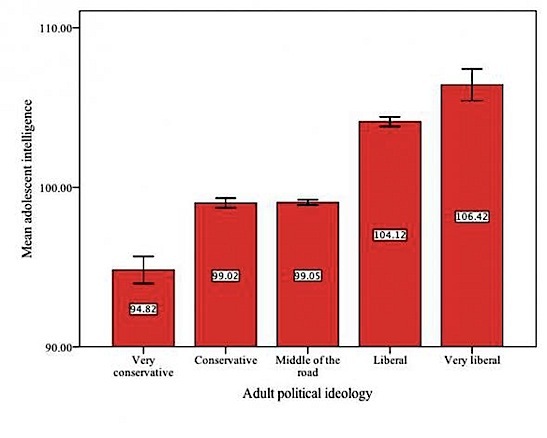 Some of the findings by Brock University are quantified in the chart plotting mean adolescent intelligence against adult political ideology. Now a professor from the University of Arkansas has echoed these sentiments, albeit in a slightly different study. This study, published in the journal "Personality and Social Psychology Bulletin", focused it's efforts on what is described as "low-effort" thinking. According to Dr. Scott Eidelman, the study's lead author, "People endorse conservative ideology more when they have to give a first or fast response." Eidelman cautions that while low-effort thinking promotes political conservatism it may not be the case that political conservatism necessarily promotes low-effort thinking. The interesting part of these studies isn't that a relationship between IQ and political orientation exists, but why it exists. The answer to that conundrum awaits further studies. This is a well-written, thought-provoking post! I'm anxious to see what further study reveals. Thank you for sharing, Penguin. As I do not accept free will I think a biological basis will be found for all human behaviors, including political orientation. The studies cited show correlation, but the detailed mechanism remains to be elucidated. The larger question, assuming this correlation holds up, is what do we as a society make of it? Good job Penguin. Great article, Penguin. Keep them coming. Can you cite the actual studies? Thanks. Just do a search on the sources cited in the article and you will find many references. Access to the original studies published in refereed journals generally require paying actual money. A more recent study published in the March issue of the peer-reviewed Social Psychology Quarterly showed that liberals, atheists, and the monogamous have higher IQ's. See http://inventorspot.com/articles/study_equates_higher_iq_liberal_atheist_and_monogamous_values_38259. I doubt that I'll see this kind of data on Fox News anytime soon. This is quite an article. To be honest, it seems a lot easier to embrace liberalism in our society today, as almost all major news sources are skewed to the left, as are college campuses and most media like music or films. If one wanted the quick answer that most agree with, one would choose to be a liberal.